Aire, is a beautifully improvised solo piano session, recorded in the moment. Its beauty shines as brilliantly as the pianist who allowed himself to simply be, and let the music flow freely. 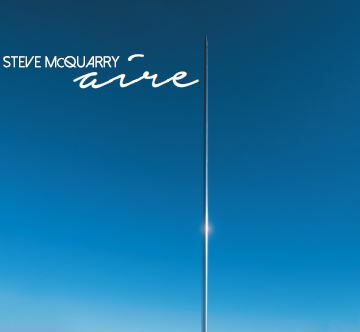 Steve McQuarry (keyboardist and composer) grew up in a home filled with his Mom’s piano playing, in Denver Colorado. He studied at the Eastman School of Music, University of Colorado at Denver, Berklee School Of Music, University Of California San Diego and Alexander University. He is an active member of the Audio Engineering Society (AES), the performance rights organization, Broadcast Musicians, Inc. (BMI), the Electronic Music Foundation (EMF), the American Society of Music Arrangers and Composers (ASMAC), the Society For Electro-Acoustic Music in the United States (SEAMUS) and Chamber Music America (CMA). Today, Stephen is composing and recording on his indie label, Mandala Records and working on orchestration projects in the film community and leads his other bands Resonance, Echelon, McQuarry Organ Trio and the Mandala Orchestra.